Pulmonary calcifications: Is it an entity in the new world dialysis patient? Metastatic pulmonary calcification (MPC) has been described in the literature to affect up to 60% of dialysis patients. Several case series of MPC were described in 1960s and 1970s. Patients are generally asymptomatic or may present with acute respiratory distress. This entity is associated with up to 60% mortality. We hereby report a case of chronic kidney disease on maintenance hemodialysis who presented with unexplained recurrent dyspnea despite adequate hemodialysis. She was evaluated and found to have a rare presentation of calciphylaxis. Metastatic pulmonary calcification (MPC) has been described in the literature to affect up to 60% of dialysis patients. Several case series of MPC were described in 1960s and 1970s. Patients are generally asymptomatic or may present with acute respiratory distress. This entity is associated with up to 60% mortality. In recent years, there is a reduction in the incidence, due to better control of serum phosphorus, hyperparathyroidism, timely initiation of dialysis, and improvement in the quality of dialysis. Despite advances in management, recent reports of MPC make it imperative for clinicians to look for it in patients of nonresolving lung infiltrates or unexplained dyspnea in dialysis patients.,, Here, we report a case of chronic kidney disease (CKD) with end-stage renal disease (ESRD) on regular maintenance hemodialysis who presented with unexplained recurrent acute respiratory distress. Our index patient is a 31-year-old female, who is a known case of hypertension (renoparenchymal) with CKD and has been on maintenance hemodialysis since 28 months (the basic disease was unknown). She presented to our hospital with fever of 1month duration and progressive dyspnea for 5 days. She was initiated on antitubercular therapy (ATT) at a tertiary care hospital in view of Mantoux positivity, ascites, axillary lymphadenopathy, and prolonged fever. On examination, she was tachypnoeic and required oxygen support. There were enlarged right axillary lymph nodes and bilateral pedal edema (right > left). Systemic examination revealed crepitations in bilateral lung fields and ascites. Her investigations are tabulated in [Table 1]. Chest X-ray revealed bilateral lung infiltrates [Figure 1]. Lower-limb venous Doppler revealed right lower-limb iliofemoral deep-venous thrombosis. Echocardiography revealed ejection fraction of 65% and no tricuspid regurgitation/pulmonary arterial hypertension. Ventilation–perfusion scan revealed matched bilateral segmental and subsegmental defects suggestive of intermediate probability of pulmonary embolism. Computed tomography (CT) pulmonary angiogram was negative for pulmonary embolism. Axillary lymph node fine-needle aspiration cytology was suggestive of large areas of necrosis with foci of calcification and Ziehl–Neelsen (ZN) stain showed occasional acid-fast bacilli (AFB). Sputum AFB and cultures were negative. A possibility of bilateral pneumonitis (bacterial/tubercular/fungal) in a patient with tuberculous lymphadenitis, right lower-limb deep-vein thrombosis, CKD-V(D) and hypertension was made. She was managed with antibiotics (:piperacillin/tazobactam), modified anti-tubercular drug (ATT) (rifampicin stopped in view of thrombocytopenia), platelet transfusion, low-molecular-weight heparin (after platelet count improved), and aggressive hemodialysis. She improved with treatment, and was discharged on modified ATT and warfarin. She was readmitted 10 days later with recurrence of fever of 2 days duration and breathlessness. Her chest X-ray showed bilateral fluffy infiltrates and was suggestive of worsening of the parenchymal lesion [Figure 1]b. She was treated with broad-spectrum antibiotics and hemodialysis. Repeat sputum and blood cultures were sterile. Vasculitis panel (antinuclear antibody: immunofluorescence method; c-ANCA and p-ANCA: ELISA method; anti-GBM: immunofluorescence method) was negative. She was intubated in view of worsening dyspnea. Bronchoscopy was done which revealed a hemorrhagic lavage. The bronchial aspirate was negative on ZN stain smear and cultures (bacterial/fungal/Mycobacterium tuberculosis rapid expert). There were no hemosiderin-laden macrophages. High-resolution CT (HRCT) of the chest revealed multiple hyperdense airspace infiltrates involving bilateral lung fields and enlarged mediastinal lymph nodes with calcification [Figure 2]a and [Figure 2]b. CT-guided percutaneous trucut lung biopsy was done which was suggestive of marked thickening of alveolar septa along with fibrosis and extensive calcification. The calcification involved septal blood vessels without any evidence of thrombosis or granulomas [Figure 2]c. Hence, a diagnosis of MPC was made. The patient succumbed to her illness despite treatment. There are two types of parenchymal pulmonary calcification that have been described so far: dystrophic and metastatic. Dystrophic calcification is caused by the deposition of crystalline hydroxyapatite calcium salt in diseased lung due to an inflammatory process such as infection, in a patient with a normal serum level of calcium and phosphate. Metastatic calcifications are caused by deposition of calcium salt in a normal lung tissue and are associated with high levels of serum calcium and phosphate. The common causes of metastatic calcification can be benign (ESRD on dialysis, primary hyperparathyroidism, milk-alkali syndrome, and sarcoidosis) or malignancy (multiple myeloma, parathyroid carcinoma, and lymphoma). Metastatic calcification in patients with CKD was first described by Virchow in 1855. Hans Selye first described calciphylaxis in 1961. Visceral calcification has been described in up to 79% of dialysis patients on autopsy. With the advent of hemodialysis, several case series of MPC have been described in the 1960s and 1970s. In an autopsy series of hemodialysis patients, histological changes of MPC were seen in 60% of the cases. Conger et al. described nine cases of MPC on autopsy which correlated with restrictive lung findings during life. Justrabo et al. reviewed 13 cases in patients on dialysis or after renal transplantation, of which seven patients died of acute respiratory distress. In the recent years, the incidence has decreased probably due to better control of serum phosphorus and hyperparathyroidism, timely initiation of dialysis thereby correcting the uremic milieu, and an overall improvement in the quality of dialysis. Despite advances in management of dialysis patients, recent reports of MPC make it imperative for clinicians to keep it in differential diagnosis of nonresolving lung infiltrates or unexplained dyspnea in dialysis patients.,, Pulmonary calciphylaxis is the most severe form of lung calcification and is characterized by small- and medium-vessel calcification, fibrointimal hyperplasia, thrombosis, and distal ischemic necrosis of lung tissue. Chest radiographs are usually normal. Findings of confluent or patchy airspace opacities, discrete calcified nodules, or diffuse interstitial process can be seen occasionally. The relative stability of these pulmonary infiltrates despite treatment helps in differentiating from pulmonary edema or infection. HRCT is more sensitive and can demonstrate calcification in approximately 60% of cases. The most common finding is multiple 3–10 mm poorly defined centrilobular nodules. Other patterns can be diffuse or patchy areas of ground-glass opacity or consolidation. High-attenuation signals are characteristic and combination of pulmonary and vascular calcification may be diagnostic of MPC. Radionuclide (Tc99m-MDP) imaging is considered to be the most sensitive technique for the early detection of MPC. Increased radioactive isotope lung uptake which are symmetrical and dense to obliterate the rib outlines is diagnostic. It can demonstrate calcification even when it is not apparent radiologically and obviates the need for invasive diagnostic procedure. The diagnosis of MPC is confirmed by histology. In lungs, calcification usually deposits in the interstitium of the alveolar septum, the walls of the bronchioles and pulmonary vessels, or large airways. Calcifications are seen on hematoxylin and eosin staining as basophilic granular, lamellar, and plate-like materials that stain positively with von kossa and alizarin red stains. In mild cases, alveolar septa are slightly edematous with short, wavy, interlacing fibers stippled by fine, basophilic calcium granules. With progression, wavy fibrils become thicker and longer, and the septa become broader and more fibrotic and may even be associated with a giant cell reaction. Vascular calcification in the lungs usually parallels pulmonary parenchymal calcification. Therapy for MPC or visceral calcification includes normalization of the CaXP product, increase in dialysis dose, therapy for hyperparathyroidism, and renal transplantation. Correction of hypercalcemia (stopping calcium supplement, Vitamin D analogs, and use of bisphosphonates) and parathyroidectomy has been reported to improve metastatic calcification., There are conflicting results after transplantation, with reported cases of worsening postrenal transplantation. Our patient presented with acute respiratory distress and MPC was proved on lung biopsy. She had hypercalcemia but a normal CaxP product which can be seen in acute cases due to deposition of crystals. HRCT chest was suggestive and diagnosis was finally confirmed on biopsy. No evidence of thrombosis was seen, and hence, a diagnosis of calciphylaxis was not made. We hypothesize that warfarin could have led to worsening of lung lesions. MPC, though rare, may occasionally be seen in our clinical practice. It should be considered in the differential diagnosis of unexplained dyspnea or nonresolving lung shadows in a dialysis patient. HRCT is only suggestive of MPC, and radionuclide scan may help in establishing a diagnosis. However, a lung biopsy is confirmatory for establishing this diagnosis. Despite advances, there is a need to understand the pathophysiology of calcification, and treatment options need to be further explored. Conger JD, Hammond WS, Alfrey AC, Contiguglia SR, Stanford RE, Huffer WE, et al. Pulmonary calcification in chronic dialysis patients. Clinical and pathologic studies. Ann Intern Med 1975;83:330-6. Justrabo E, Genin R, Rifle G. Pulmonary metastatic calcification with respiratory insufficiency in patients on maintenance haemodialysis. Thorax 1979;34:384-8. Davenport A. Sudden onset of adult respiratory distress syndrome (ARDS) in a long standing chronic haemodialysis patient with lung calcification. Nephrol Dial Transplant 2006;21:807-10. Madhusudhan KS, Shad PS, Sharma S, Goel A, Mahajan H. Metastatic pulmonary calcification in chronic renal failure. Int Urol Nephrol 2012;44:1285-7. Eggert CH, Albright RC. 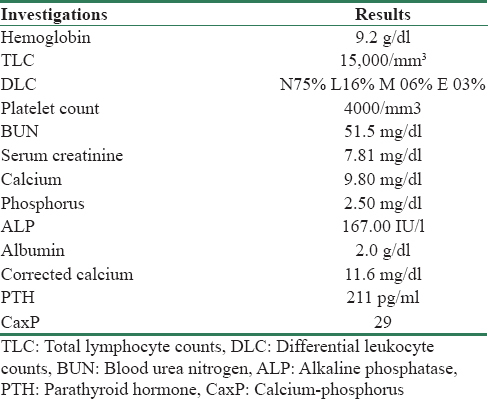 Metastatic pulmonary calcification in a dialysis patient: Case report and a review. Hemodial Int 2006;10 Suppl 2:S51-5. Bendayan D, Barziv Y, Kramer MR. Pulmonary calcifications: A review. Respir Med 2000;94:190-3. Chan ED, Morales DV, Welsh CH, McDermott MT, Schwarz MI. Calcium deposition with or without bone formation in the lung. Am J Respir Crit Care Med 2002;165:1654-69. Selye H, Gentile G, Prioreschi P. Cutaneous molt induced by calciphylaxis in the rat. Science 1961;134:1876-7. Kuzela DC, Huffer WE, Conger JD, Winter SD, Hammond WS. Soft tissue calcification in chronic dialysis patients. Am J Pathol 1977;86:403-24. Li YJ, Tian YC, Chen YC, Huang SF, Huang CC, Fang JT, et al. Fulminant pulmonary calciphylaxis and metastatic calcification causing acute respiratory failure in a uremic patient. Am J Kidney Dis 2006;47:e47-53. Nigwekar SU, Kroshinsky D, Nazarian RM, Goverman J, Malhotra R, Jackson VA, et al. Calciphylaxis: Risk factors, diagnosis, and treatment. Am J Kidney Dis 2015;66:133-46. Contiguglia SR, Alfrey AC, Miller NL, Runnells DE, Le Geros RZ. Nature of soft tissue calcification in uremia. Kidney Int 1973;4:229-35. Yigla M, Keidar Z, Safadi I, Tov N, Reisner SA, Nakhoul F, et al. Pulmonary calcification in hemodialysis patients: Correlation with pulmonary artery pressure values. Kidney Int 2004;66:806-10. Belém LC, Zanetti G, Souza AS Jr., Hochhegger B, Guimarães MD, Nobre LF, et al. 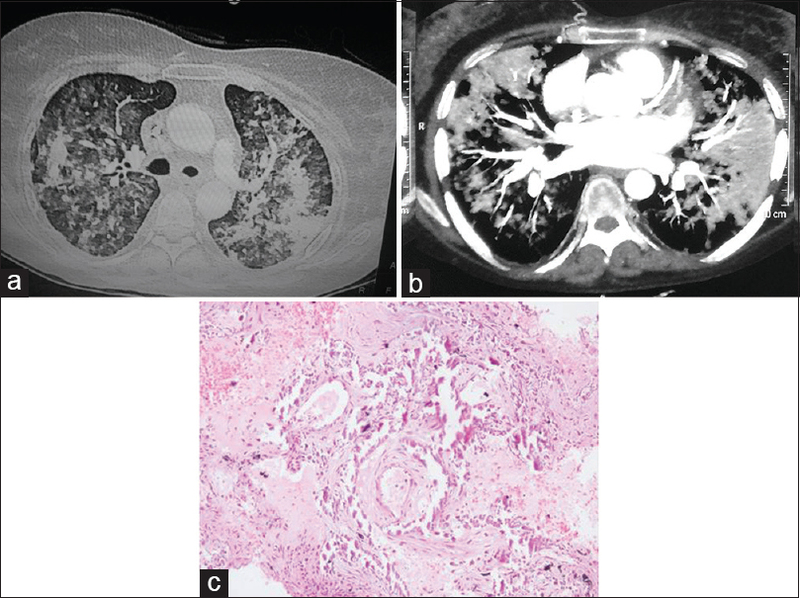 Metastatic pulmonary calcification: State-of-the-art review focused on imaging findings. Respir Med 2014;108:668-76. Hartman TE, Müller NL, Primack SL, Johkoh T, Takeuchi N, Ikezoe J, et al. Metastatic pulmonary calcification in patients with hypercalcemia: Findings on chest radiographs and CT scans. AJR Am J Roentgenol 1994;162:799-802. Rosenthal DI, Chandler HL, Azizi F, Schneider PB. Uptake of bone imaging agents by diffuse pulmonary metastatic calcification. AJR Am J Roentgenol 1977;129:871-4. Murris-Espin M, Lacassagne L, Didier A, Voigt JJ, Cisterne JM, Giron J, et al. Metastatic pulmonary calcification after renal transplantation. Eur Respir J 1997;10:1925-7.